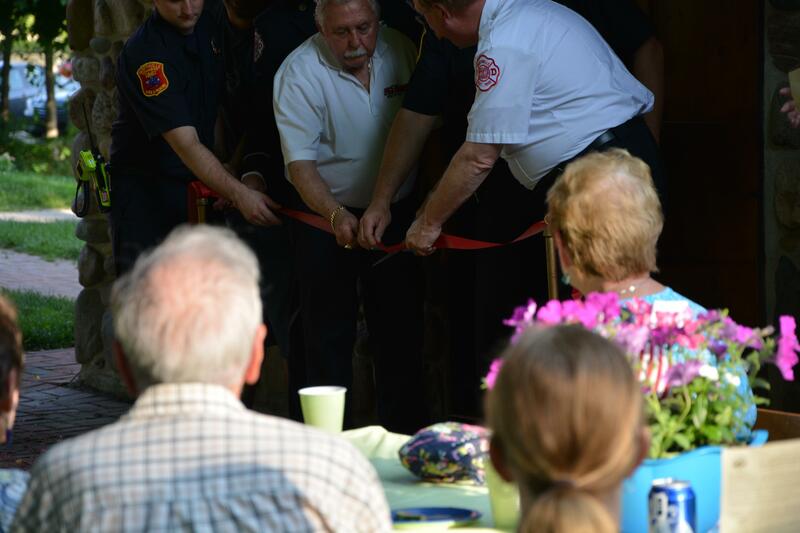 On Friday, May 27th, the ribbon was cut opening the new exhibit in the Hirsch Exhibit Hall for the 2015 season. This year, our archivist, Carri Lee, along with a team of volunteer, established a new permanent exhibit and a rotating exhibit. The permanent exhibit shows a number of photographs illustrating manufacturing in Northville as well as a number of “then and now” photographs showing prominent places as they existed years ago and today. 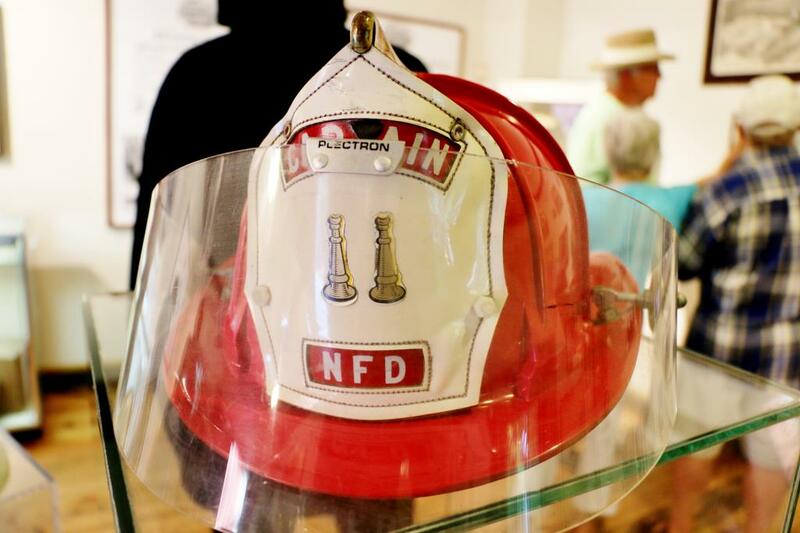 In addition, there is an exhibit that celebrates the 125 anniversary of the Northville Fire Department. 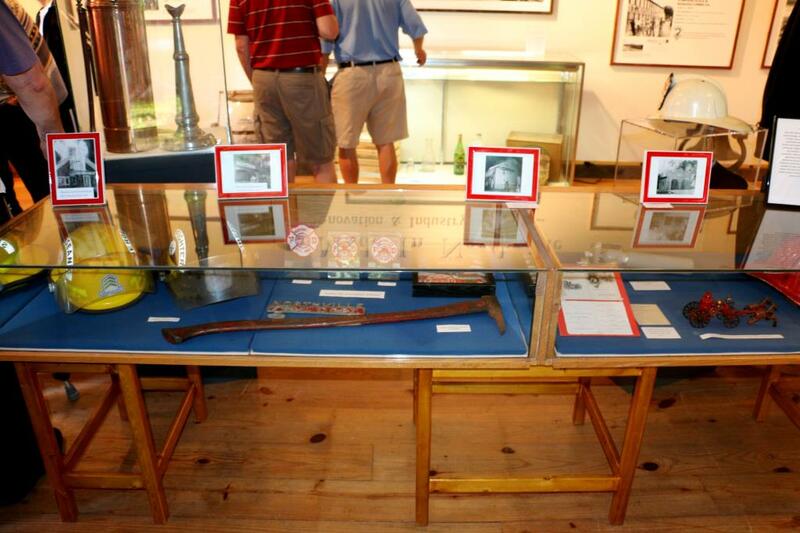 Carri worked closely with several members of the fire department to assemble and display a number of artifacts from years gone by. This exhibit will be available to the public on Sunday beginning June 7th. 9:00 – 12:00 Northville’s 3rd-grade classes will tour historic buildings. 1:00 – 4:00 Museum Buildings Open. Mill Race Museum building will be open for self-guided tours. Docents will be on site to answer questions and offer special insights. As always, free of charge. General Store will be open for shopping and browsing. Interurban Waiting Station has a new interpretive display. Blacksmith Shop comes alive with a smithy demonstration. Hirsch Exhibit Hall features: “A Window on our Past”. A retrospective of the past fifty years of the Northville Historical Society. Wash-Oaks School will be in session. New School Church, which served as the town’s library for 72 years. Hunter House will be open. Yerkes House and award-winning garden will be open. The parlors and dining room have been redecorated. Cottage House will have a weaving demonstration. Mill Race Museum buildings will be open for self-guided tours. Docents will be on site to answer questions and offer special insights. See above descriptions for information. As always, free of charge. Our General Store with its unique selection of items will be open for business. Credit cards accepted. The Cady Inn once again will become a late 19th century boarding house as the Fred’s Ice Cream offers a menu of beverages, ice cream, snacks, and more! Complimentary tea will be served. You are invited to eat inside or enjoy a picnic along the Village Green. Children’s Games of the Victorian Era will be demonstrated and organized outside the Wash-Oaks School. Gifted storytellers will retell the legendary tales of Paul Bunyan and others inside the Wash-Oaks School. Friends of the Northville District Library will sell used books in the New School Church, which served as Northville’s library for 72 years. Sweet melodies from a bygone era will be heard from our Gazebo. A talented ensemble of musicians will play hammered and Appalachian dulcimers. Northville High School’s award winning men’s and women’s choral ensembles will perform Victorian Era favorites at various venues throughout the Village. Purchase a chance to win a prize with a fast swimming plastic duck. Race will begin, following the traditional parade of participants, at 3:30, in the swift currents of the Rouge River, upstream from the Ford Field Bridge. Duck Race. Rouge River by the Ford Field Bridge. Sunday, September 15th. Doll House Raffle. Purchase a chance to win a beautiful, Victorian dollhouse. Sunday, September 15th. “An Evening with Franklin and Eleanor Roosevelt” at Genitti’s Dinner Theater on November 14th. You may have been asking yourself (or maybe not) what the difference is between the Northville Historical Society (NHS) and Mill Race Village. NHS is an organization that was founded 49 years ago with a mission statement which states in part, “of bringing together those people interested in history, and especially in the history of the Northville, Michigan, region. To this end, … (NHS) may collect printed materials, manuscripts, and artifacts relating to the history of the Northville area.” NHS maintains a number of historical exhibits and an archive consisting of thousands written documents, photographs and artifacts all related to the history of the greater Northville Community. The major attraction which is managed by the NHS Board of Directors is Mill Race Village which was founded in 1972, 41 years ago. Mill Race Village is open all year although the buildings are open with docents to explain the history of each building from early June until early September. It is important for those who appreciate the mission and contribution of the NHS and Mill Race Village to know that none of the funding for these efforts comes from public funds. Neither the City nor the Township supports these projects. The money required comes exclusively from membership dues and from donations. The Northville Historical Society will be launching the 2013 membership drive in August and we hope that a growing number of citizens in our community will become members and donors for what we believe and hope is a worthwhile effort for our community. Don’t miss our exciting Cemetery Walk with all new characters. This year’s walk focuses on Northville’s involvement in the Civil War. Learn who fought the war, how it was fought, what those at home had to endure, who survived and what life was like afterwards. Discover the horrors of war and what actually killed the majority of our soldiers. Refreshments following at the Art House next to the cemetery. Tickets $10 or $8 for groups of 10 or more, $15 day of event. Get your tickets at Knightsbridge Antiques on Seven Mile Rd. or Mill Race Village from 9-1 pm Mon-Fri or Sundays 1-4 pm. The Casual T’s, a Model T Chapter in southeast Michigan, visited Mill Race Village on August 14, 2011. The rain didn’t keep them away. Check their page to see a photo gallery of them.